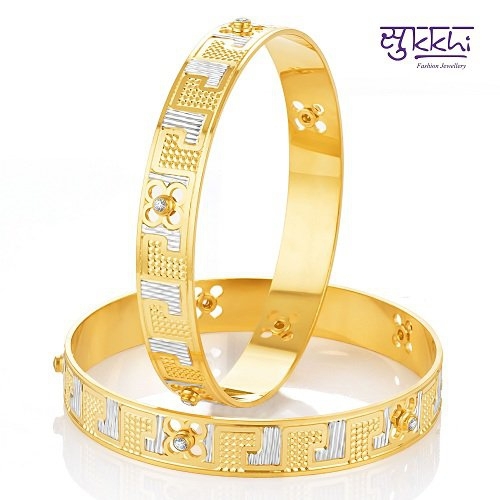 This Sukkhi Delightful Gold & Rhodium Plated Dancing CZ Stone Bangles is made of alloy. Women love jewellery; specially cubic zirconia stone jewellery adore a women. They wear it on different occasion. They have special importance on ring ceremony, wedding and festive time. They can also wear it on regular basis . Make your moment memorable with this range. This jewel set features a unique one of a kind traditional emblish with Cubic Zirconia and beautiful gold plated finish.Feature:Brand: Sukkhi Vendor Name: Marshall ArtsStone: Cubic ZirconiaMaterial: AlloyGender: FemaleColor: White and GoldenAvailable Size:2.4,2.6,2.8,2.10Mail at bhaveshjnavlakha@gmail.com for your ring sizeShipping Dimensions & Weight:Length: 5.5"Breadth: 4.0" Height: 1.5"Weight: 115gProduct's Length & Weight:Weight: 15gNOTE: Avoid of contact with water and organic chemicals i.e. perfume sprays. Avoid using velvet boxes, and pack them in airtight boxes. After use, wipe the jewellery with soft cotton cloth.